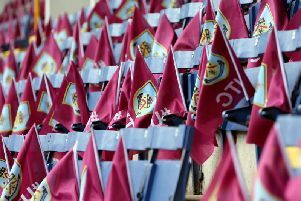 Burnley FC Women earned a place in the semi-final of the Lancashire FA Women’s Challenge Cup through Lynette Craig’s 73rd-minute goal at Chorley on Sunday. The Clarets had two early chances cleared off the line, and Lauren Bracewell saved a penalty to keep the score level, but the Clarets’ persistence paid off when Craig saw her chance and fired the Clarets into the last four. When the game got underway, Chorley replied to an early Burnley attack by winning a corner. The kick was launched into the Clarets’ box and found the head of Kerry Nickson, whose attempt flew wide of the post. From the goal kick, the Clarets were quick to respond, Leah Embley charged down the wing and passed through to Sarah Greenhalgh, but as she set her sights on goal, clever defending from the home side ruled her off-side. The Clarets maintained a strong momentum in the early stages of the game. Sammy Fleck headed at goal from a corner that was cleared off the line and scrambled away. Then minutes later Greenhalgh headed at goal from another corner, and this was deflected over the bar from the head of a defender. On 30 minutes the Clarets were dealt a severe blow when Chorley’s Lisa Topping shot from within the 18-yard box and hit the body of a defender at close range. The referee was well positioned and determined that the ball also struck the defender’s hand, and awarded a penalty. Bracewell guessed and dived at her right-hand post to save the kick, which lacked the necessary power. Chorley grew stronger in the game as they looked to find a way through, but determined defending protected Bracewell’s goal, before the Clarets picked up the momentum again. Late in the half they pressured the home goal. Charlotte Banner intercepted a high ball and headed forward to Lizzy Hamer, who fed through to Greenhalgh. Greenhalgh outpaced her markers and cut through on goal, but shot wide of the post as the keeper closed down her angle. In the second period, the home side’s goal quickly came under pressure as the Clarets attacked from different angles. Greenhalgh had the best of the chances when she forced an out-stretched reaction save from the keeper. Both teams defended well and limited scoring chances. Chorley also played the off-side trap to their advantage, and kept the Clarets at bay until Justine Wallace played a perfectly-weighted pass for winger Lynette Craig to run forward onto. As she closed on the box, she flicked the ball forward to pick out Greenhalgh. The ball was intercepted and ran loose, but Craig quickly regained possession and shot into the goal, well out of reach of the keeper. Tight defending kept further chances to a minimum and Bracewell was called into action to tip over a long range shot from Chorley’s Grace Vella. Greenhalgh could have doubled the lead late on as she was dragged down by the home keeper outside the box. The referee awarded a free kick but did not take further action. In the last minutes, Greenhalgh smartly tipped the ball over challenging defenders heads and shot at goal, where the home keeper was ready to collect. Chorley had a final chance to equalise as they pushed forward, and a cross was headed wide. At the final whistle the Clarets won by a single goal but fully deserved a place in the semi-final draw. Burnley FC Women are back in league action against second placed Brighouse Town LFC in a key fixture at the Arbories, kick-off 2 p.m.